XL Video was one of the principal worldwide technical production suppliers to Roger Waters’ seminal ‘The Wall Live’ world tour, which finally wrapped in Paris on September 21 with a sold out Stade de France show, exactly three years and one week after its opening show in Toronto in 2010. Richard Turner, the tour’s video director worked closely with XL’s project manager Phil Mercer throughout, together with tour director Andrew Zweck and creative and video content director Sean Evans. The production featured both stadium and arena versions and is acclaimed as one of the most memorable and technically ambitious touring shows on every level. The performance was a complete rendition of The Wall, one of the best loved and most compelling art-rock albums ever. 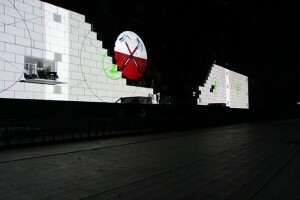 Every single brick in a 420 ft wide (stadium version) projected wall was individually mapped, and the built section cued into place during a fully choreographed construction over the course of the first half of the show. The original production design concept and base architecture for The Wall tour was created by stage architects Jonathan Park and the late Mark Fisher, and dates back to the first Wall Tour by Pink Floyd in 1980/81. The cardboard bricks of the 2010-2013 tour were built by TAIT who also supplied all the stage machinery and engineering – it was erected and demolished each gig by a team of 15 dedicated carpenters headed up by Denny Rich. 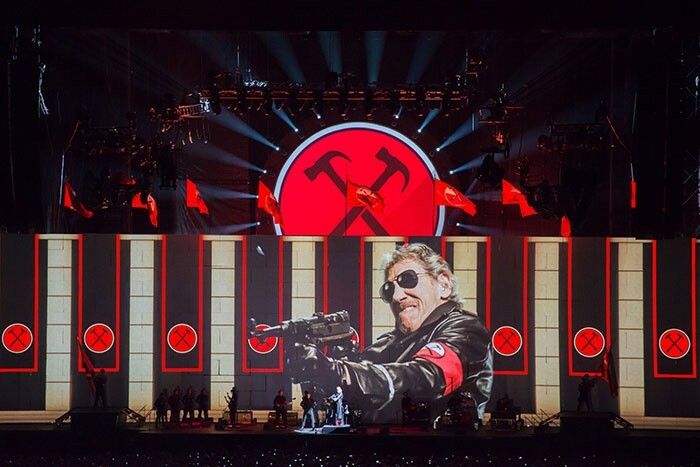 The stunning, provocative and highly emotive show visuals were projected onto the wall by 36 of XL’s new Panasonic PT-DZ21K 20K projectors – divided into nine screen areas – each covered by a quad stack rigged on standard Leyher scaffold platforms at FOH. Seamless edge-blending was achieved by custom manual shutters clamped onto the scaffold towers. 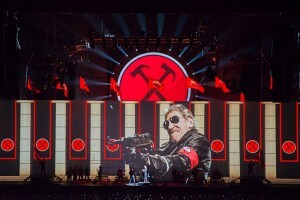 Physical shuttering and blending was demanded by the "black" nature of the content - if only electronic blending had been used, the "tombstone" effect of the eight overlapping projectors in the blend zone would have been unacceptable to Roger Waters. Previously when they played arenas, a special DMX controlled shuttering system, comprising a series of metal blades on adjustable screw threads, was devised by Turner and built by TAIT to ensure that there could be a complete blackout across each batch of projectors. It was a fundamentally straightforward technique that worked extremely well. At 15,200 pixels wide for the stadium show, the video content was being projected at nine times higher resolution than HD, far bigger than IMAX imagery. It had to be created at that actual size – which entailed some serious editing processes and equipment at Breathe Editing in New York - then back at the show, was split into 10 HD channels (the tenth fed a 30ft diameter circular projection screen behind the wall). After Effects was used to split the full 15k canvas into 10 individual playback channels. Content was stored on 10 Mac Mini servers (10 more provided fully redundant backup) with 10 AJA IoXT capture / playback boxes plugged in via Thunderbolt to give a hardware gen-lock across all 20 machines for frame-accurate playback. True hardware gen-lock (rather than just "frame accuracy") was required because of the "hard cut" nature of the visuals - nine cuts happening at sub-frame slightly different times would have again been unacceptable to Roger Waters. Each Mac Mini was running a Final Cut project for assembly and changes - the resultant movies were syncronised with VVTR from Gallery.co.uk. Ten Blackmagic ATEM switchers – one channel per screen area - was used to apply specific effects like lighting and keying across the content, all connected together by another hot-rodded piece of software called Just Macros. This was developed by John Bengston to allow the dynamic uploading of masks in realtime during the show as the bricks were added to the wall in the 242 manually executed brick-building projection cues. There was content for all bricks all the time, and each manual cue simply revealed another brick’s worth of imagery. The playback rig was designed, supplied and built by Lucky Frog Ltd. - Turner’s company - which celebrated its tenth anniversary while out on this final leg of the tour. The ATEMs were also used for extremely fast and responsive direct mixing of live camera feeds for the IMAG projections which came from two of XL’s Sony HXC100s stationed at FOH with long lenses. The majority of the ‘IMAG’ in the show was actually pre-recorded from one of the early arena shows and composited onto the original five-screen arena version of the show. The intention for the nine-screen stadium variant was for the whole show to be extended in this fashion, but when the process started, Waters decided there were many moments that demanded the original content be reformatted from the 8560 pixel wide arena version to the full 15k wide. The show was recorded every night for Waters. A long lens camera was used to follow him and composited with a live wide shot and close ups from the fake IMAG so he could learn every move from the shoot and mimic it perfectly whilst it was playing out onscreen! Having consumed over three years of his life, Richard Turner comments: "A very common complaint or excuse is "No time - No money". The latest touring version of "The Wall" demonstrates what can be achieved when you have a leader with plenty of both, and more importantly a clear, intelligent, reasoned vision of the goal." In 1980 the show set the benchmark - and heralded the arrival of large scale touring rock shows. "Over the last three years we have reset that benchmark, and in the words of the boss ‘May well have raised the bar beyond the reach of others’. I believe this to be the case as it’s probably not possible, culturally or economically, for any artist or entity to put the amount of effort and sheer attention to detail required to better ‘The Wall’." Turner feels that the show’s iterations book-end the "big rock show" era perfectly. He’s already done bigger, brighter and more complex shows in the Middle East in the breaks between legs, but states that "nothing will ever be cooler or better than this". One of his earliest childhood memories is playing with his father’s slide projectors and camera. For a starry-eyed 14-year-old in 1980 hanging PAR cans in trees at little hippy festivals around East Anglia with posters of the Floyd on his bedroom wall … working on The Wall was a dream come true. On XL Video, Turner comments: "XL’s global reach, unparalleled touring video experience and 24/7 support was a constant reassurance whilst out on the road. Their willingness to embrace new technologies really helped when we wanted to use Panasonic projectors because of their small, light and compact form factor. XL was faultless as usual." Mercer adds: "This project was unique with its three-year duration from first show to last show and proved to be a challenge in consistently delivering state of the art solutions throughout. For example, to provide projection for the most recent stadium run, we updated the projectors with the purchase of new Panasonic PT-DZ21K units." Gareth Jeanne was XL’s day-to-day project manager and Chris Kansy the tour’s production manager. The touring video crew were crew chief Andy Joyes, playback operator Phil Haynes, Richard Turner’s apprentice Eleana Clement, projectionists Ed Moore and Gabby Linford, and Paul Maddox-Jones, who looked after the cameras. The Wall Live tour played 219 shows worldwide to more than 4.1 million ticket buyers, grossing $460 million, which is not only the highest grossing tour ever by a solo artist, but also the third highest grossing tour of all time! (behind U2 – ‘360’ and The Rolling Stones – ‘A Bigger Bang’).